Terrified you are going to end up with a denture? Think that your teeth do not have a future? Would you like to throw your dentures away? Do you struggle to chew food? At your wits end with denture fixative? Think it’s too late to do anything about your dental problems? Anxious or have little time for extensive trips to the dentist? Gentle Dentistry has the solution. 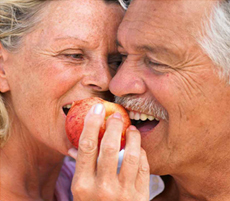 Say goodbye to your wobbly teeth or ill-fitting dentures and say hello to a brand new smile. Same day teeth is a revolutionary new procedure providing fixed teeth in a single day. The concept is based on carefully placed implants which are positioned as foundation for a fixed bridge. The treatment produces excellent cosmetic results, is performed in a day and is great value for money. We are proud to add this to our comprehensive list of dental services. This new technique has been developed by a world-class German dental technology company. Our implant surgeon, Daniel Cattell, BDS, DPDS is one of the few dentists in the country to have trained to offer this service. After an initial dental examination our dentist will determine if you are suitable for this procedure. One fantastic feature of Same Day Teeth is that patients can still have this treatment even after years of wearing traditional dentures with associated jaw shrinkage. Prior to the day of treatment, we will work with you to fully explain the procedure and give you a clear idea of how your new teeth will look and function and what the treatment will entail before you embark on the journey. If you are suitable, your treatment will be meticulously planned including 3D CT Scanning. On the day of surgery (under dental sedation provided by a consultant anesthetist) we will place 4 or 6 dental implants, in each jaw, and after a couple of hours your new teeth will be fitted over the top. New teeth in a single day! After three months your permanent natural tooth shade bridges are fitted to complete treatment. Will this process work for me? Dental implantology, a core part of the process, has been developed since the the early 1970’s when they were invented by Professor Branemark of Sweden. Success rates are very high (> 97%).Looked after correctly implants offer a highly functional and aesthetically pleasing long term alternative to dentures and missing teeth. Interested? Call Lara now on 01202 432838 to find out more or to arrange an initial consultation to discuss your problems.